Why do steakhouses frequently outperform pasta restaurants? Gross margins for pasta items are often higher than 70%, while the margins on steak are often lower than 50%. The other way to say this is that pasta based menu items may have a food cost percentage around 25%, chicken around 33% and steak and chop items around 50%. The key to making money with food or beer is keeping your attention on the cash contribution margin per transaction, the average contribution margin across your sales items, and the number of transactions, not on the cost percent margin or the gross percent margin. You can’t put percentages in the bank. This is also why the brewpub business model is more profitable than the production brewery. Even though a brewer’s percent margin is usually between 45-65%, the dollar volume collected per transaction is quite small, ~$0.23 per pint. Retail bars on the other hand have a much smaller percent margin, ~30%, but because they are further down the value chain and closer to the consumer, they collect about $0.83 per pint! See below for more information. Wise entrepreneurs know that what you earn is driven by the actual volume of dollars (or other currency) you make per transaction. As we demonstrate carefully in our menu engineering lesson under Controlled Operations, a nice plate of spaghetti and meatballs may cost you $4, and be sold for $12. With a 66% gross margin, or food cost percent of 33% that is right in line with industry averages. You get $8.00 per sale contributed toward covering your overhead costs and adding to profits. Meanwhile that “Prime Rib Palace” discount steak and brew restaurant down the street fetches $19.95 per transaction, at only a 50% gross margin (or a whopping 50% food cost percent) is contributing $10.05 toward overhead and profits with each sale. Which business model is better? The business model with the percent advantages or the one with the dollar advantages? This paper uses the percent margin analogy to describe just how hard it is to make it as a production brewery versus a brewpub. You may zoom in on this high-resolution image. You will see that the gross margin (per pint of beer) for making beer at a production brewery (Operations) is 60%, and this only translated into $0.23 of actual dollar volume per pint sold by the brewery. Meanwhile, the distributor margin is only 25%, less than half that of a brewery – but the distributor’s dollars earned per pint is $0.30. 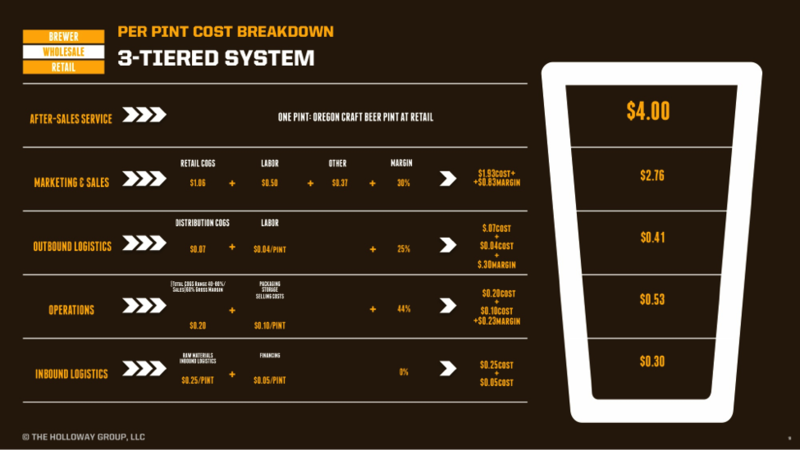 In the traditional “three tiered” system in the USA, all the pints go through distributors, so the unit volumes (amount of pints sold) are the same. The retailer margin is 30%, and the retailer dollar volume per pint sold is $0.83. Which business would you rather be in? Now think of a brewpub that internalizes (or “integrates”) this value chain, collapsing and funneling all those roles, and their margins into one business. That’s $1.36 dollar volume for every pint a brewery sells through its own brewpub or tasting room. Take that to the bank!! Wise managers do not get led astray from the true goals [watch 'Wisdom' under Leaderships & Culture]. In business, the financial goal is consistently depositing more assets into the bank than one withdraws to pay for expenses. The financial goal is not pursuit of high percentage measures, and you don’t deposit or pay bills with percentages. Margin percentages are statistical indicators that are related to the goal, but are not the goal itself. Don’t be fooled, keep your eyes on the cash.